The U.S. Food and Drug Administration said it is working with officials in Canada on the outbreak, which has sickened 32 people in 11 states and 18 people in the Canadian provinces of Ontario and Quebec. Two individuals in Illinois have tested positive for this same outbreak strain of E. coli, according to the Illinois Department of Public Health. People are also being advised to throw out any romaine they have at home, including whole heads of romaine and hearts of romaine. 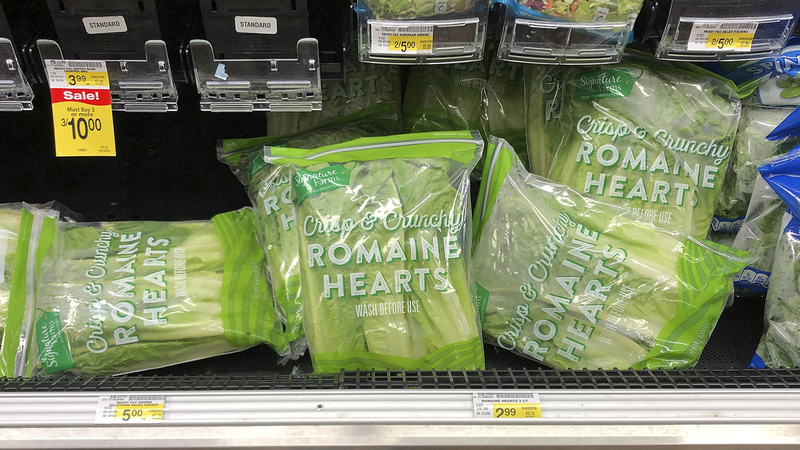 Officials are also advising consumers to throw out any bags and boxes of precut lettuce and salad mixes that contain romaine, including baby romaine, spring mix and Caesar salad. “If you do not know if the lettuce is romaine or whether a salad mix contains romaine, do not eat it and throw it away,” IDPH said in a statement. Most people who are infected will begin feeling sick within three to four days after consuming products that contain the bacteria, but illness can start anywhere from one to 10 days after exposure, according to IDPH. Infections from E. coli can cause symptoms including severe stomach cramps, diarrhea and vomiting. Most people recover within a week, but some illnesses can last longer and be more severe. “Contact your health care provider if you have diarrhea that lasts for more than three days or is accompanied by fever, blood in the stool, or so much vomiting that you cannot keep liquids down and you pass very little urine,” IDPH said in a statement.